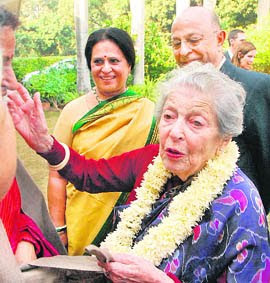 Fori Nehru, Hungarian by birth, celebrated her 100th birthday. Fori Nehru is the wife of BK Nehru. BK Nehru was a cousin of Jawaharlal Nehru. Fori Nehru met BK Nehru when they were students in London. They went on to marry in 1935 over the protests of his brahmin family. She was agile and alert at the age of 100. She is such a graceful woman that she serves the country whole heartedly. BK Nehru was a distinct civil servant, a diplomat, served as Governor of Assam, Jammu and Kashmir, Gujarat. They both are most respected enviromentalists. Shobha (Fori) Nehru looked good, dressed in a purple sari, as she went on to greet guests. She started enquiring about friends and family. Sipping a cup of kahwa, an Indian Recipe, she seemed to enjoy every moment as her beloved ones gathered to celebrate her 100th birthday in the city. She dedicated her whole hard work for the welfare of our country as she became Indianized, once she got married to BK Nehru.